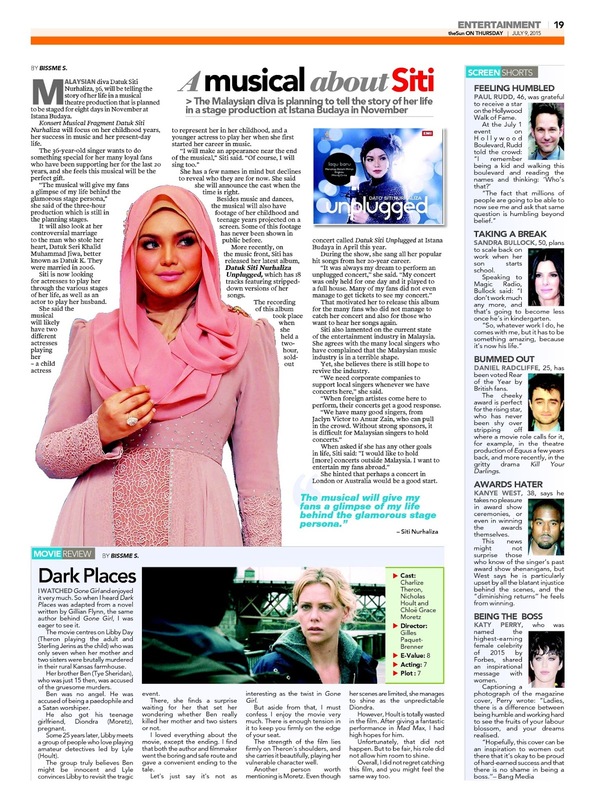 The popular singer Siti Nurhaliza talks to theSun about putting a musical theatre production that will tell the story of her life to her fans out there. Read here for the full story. who have been supporting her for the last 20 years, and she feels this musical will be the perfect gift. “The musical will give my fans a glimpse of my life behind the glamorous stage persona,” she said of the three-hour production which is still in the planning stages. It will also look at her controversial marriage to the man who stole her heart, Datuk Seri Khalid Muhammad Jiwa, better known as Datuk K. They were married in 2006. Siti is now looking for actresses to play her through the various stages of her life, as well as an actor to play her husband. She said the musical will likely have two different actresses playing her – a child actress to represent her in her childhood, and a younger actress to play her when she first started her career in music. “I will make an appearance near the end of the musical,” Siti said. She has a few names in mind but declines to reveal who they are for now. She said she will announce the cast when the time is right. Besides music and dances, the musical will also have footage of her childhood and teenage years projected on a screen. Some of this footage has never been shown in public before. Datuk Siti Nurhaliza Unplugged, which has 18 tracks featuring stripped down versions of her songs. The recording of this album took place when she held a two hour, soldout concert called Datuk Siti Unplugged at Istana Budaya in April this year. During the show, she sang all her popular hit songs from her 20-year career. “It was always my dream to perform an unplugged concert,” she said. That motivated her to release this album for the many fans who did not manage to catch her concert and also for those who want to hear her songs again. Siti also lamented on the current state of the entertainment industry in Malaysia. She agrees with the many local singers who have complained that the Malaysian music industry is in a terrible shape. Yet, she believes there is still hope to revive the industry. “We need corporate companies to support local singers whenever we have concerts here,” she said. “When foreign artistes come here to perform, their concerts get a good response. She hinted that perhaps a concert in London or Australia would be a good start.